While the word ‘unprecedented’ has become overused and thereby devalued, we should have little hesitation in using it in relation to the Syrian refugee crisis, which is unprecedented – or at least unusual – in a number of ways. First, the scale of Syrian displacement is exceptional. More than seven million people have been uprooted within the country, while some four million have fled to neighbouring and nearby states. Syrians now constitute the second largest refugee population in the world, after the Palestinians. Second, the speed of the Syrian exodus has been astonishing. In the first year of the armed conflict in Syria, 2011-12, the movement of people out of the country was very modest in size. But that trickle became a mass exodus as the civil war intensified, and as civilian populations found themselves in the line of fire. In one 12-month period, the number of Syrian refugees in Lebanon rocketed from just 130,000 to over one million. Third, the Syrian refugee emergency is characterized by its wide geographic scope. During the past three years, Syrians have been fleeing in all directions, with the majority of them going to nearby countries such as Lebanon, Turkey, Jordan, Iraq and Egypt. But that movement has now spread to North Africa and the Mediterranean, to the Balkans, southern Europe and Scandinavia. Fourth, the emergency is unusual in terms of the settlement pattern of the exiled Syrians. There is still a tendency to associate the word ‘refugee’ with sprawling tented camps, where basic needs such as shelter, food, are provided by an array of aid agencies. But that is not the case for the vast majority of Syrians. In Egypt and Lebanon, no refugee camps have been established, although the latter country has witnessed the emergence of ‘informal settlements’, ramshackle concentrations of refugees which have all of the disadvantages of organized camps and none of the advantages. In Jordan, over 80 per cent of the refugees are living outside of camps in urban and rural locations. 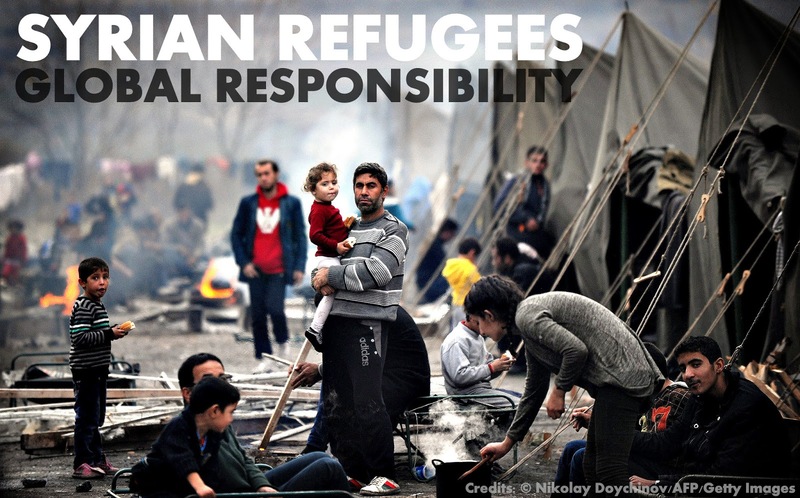 A fifth important characteristic of the Syrian refugee emergency has been the scale of the response to it. The latest UN appeal for Syrian refugees amounts to over $4 billion, the largest in humanitarian history. Well over 100 different agencies are involved in the operation. Governments in the region, especially Turkey, have spent billions of additional dollars in their response to the emergency. Sixth, the Syrian refugee crisis is unusual in terms of the number of other major emergencies that have erupted at the same time, including those in Iraq, South Sudan, the Central African Republic, Ukraine, Yemen, the typhoon in Philippines, the Ebola crisis in West Africa and the earthquake in Nepal. At the same time, longstanding refugee situations such as those involving Afghans, Somalis and Sudanese have persisted. As many aid agencies have pointed out, the whole humanitarian system is now under very serious – perhaps even unprecedented – pressure. A final characteristic of the Syrian refugee situation concerns the impact of the refugee influx on host countries and communities. This is not a new issue. For decades, countries such as Kenya, Pakistan and Bangladesh have drawn attention to the heavy costs they incur in hosting significant numbers of refugees, not only financially, but also in terms of the refugee impact on their economy, environment, infrastructure and security. Such issues are of particular concern in relation to the Syrian refugee emergency, especially in Lebanon, where refugees now constitute 25 per cent of the population. According to the World Bank, the Syrian refugee influx and armed conflict are progressively reducing the country’s Gross Domestic Product. Government revenue collection has slumped while state expenditure has increased, due to the massive new surge in demand for services. Schools and health facilities are overcrowded. The quality of water, sanitation and waste disposal services has deteriorated. Unemployment and consumer prices have both risen. To makes the situation worse, the Syrian refugee emergency show no sign of coming to an end. During a visit to the region in 2012, many refugees said they could survive for a while by supplementing their assistance they by making use of their savings and borrowing money, pending the time when they could return to their homes. On more recent visits, it has become clear that the majority of refugees have depleted whatever resources they had, have gone heavily into debt, that they have to resort to negative coping mechanisms and see no early prospect of going back to Syria. Hence the decision of growing numbers of Syrians to make their way to Europe. There is a wealth of evidence to support that last remark. States in the region are periodically imposing border closures and other forms of control that make it more difficult for Syrians to seek and find asylum in other states. The frequency with which Syrians are detained and deported appears to be on the rise. Women and girls are at growing risk of gender based violence. Children more generally – and in Jordan and Lebanon they constitute just over half of the refugee population – are being taken out of school so that they can work and contribute to the family income. Even so, the refugees are struggling to survive. Assistance levels are declining because of a shortage of funds, with the result that two out of every three Syrians in Jordan are now living below the official poverty line. These are all serious protection problems, but they have to be considered in a broader historical and geographical perspective. Let us recall what has happened in some other refugee emergencies during the past 25 years. In 1991, Turkey deployed its armed forces along its mountainous border with Iraq, in order to prevent an influx of Kurdish refugees. Hundreds died as a result. In 1996, the Tanzanian military rounded up half a million Rwandan refugees and forced them to go back to their country of origin. In 2008 and again this year, a spate of violent attacks took place in South Africa killing, injuring and displacing refugees who had made a home in that country. During the past 18 months, the Kenyan authorities have tried to force refugees out of the capital city of Nairobi, insisting that they be confined to camps in the remote north-east of the country. At the same time, the residents of those camps have come under growing pressure to return to Somalia, despite the continuing armed conflict and drought in that country. Protection crises of this type have not occurred in the countries neighbouring Syria. Borders have never been completely closed. Large-scale refugee expulsions have not occurred. Syrians have generally been allowed to choose their place of residence. And despite many predictions to the contrary, large-scale violence between the refugees and their local hosts has not erupted. This scenario raises two questions. First, why has the region’s response to the Syrian refugee emergency been so generous? And second, what can be done to ensure that such generosity is sustained in the months and years to come? With respect to the first of those questions, it is difficult to ascribe the willingness of Syria’s neighbours to host such large numbers of refugees in terms of their legal obligations, as they are not signatories to the 1951 Refugee Convention. Indeed, as many commentators have suggested, the region’s difficult experience with the Palestinians might have led them to exclude another large and potentially long-term refugee population. Other variables would seem to be at play. The absorption of such a large refugee population is evidently linked to the fact that Jordan, Lebanon, Turkey and Iraq are middle-income countries, with a greater capacity to host refugees than many states in Africa and Asia. It is connected with the strong cultural, linguistic and ethnic affinities that the refugees share with their hosts. And it is because the western powers, alarmed by the evolving geopolitics of the region, have been prepared to make enormous amounts of humanitarian assistance available to the refugees, and to a lesser extent the local population. With respect to the question of sustaining the region’s generosity towards the Syrian refugees, there are three principle ways forward. First and most obviously, there is a need for the international community, to make a far more robust effort to bring the Syrian conflict to an end. This might seem to be a forlorn hope, given the failure of Special Envoys such as Kofi Annan and Lakhdar Brahimi to make any progress in the establishment of a peace process. But perhaps the situation is changing. With growing numbers of Syrians now making their way to Europe, adding to a Mediterranean refugee and migration crisis that has completely confounded the continent, could it be that the EU and its allies will finally recognize the need for more determined conflict resolution efforts? Second, it has become increasingly clear that even a fully funded emergency operation would not meet the longer-term needs of the refugees and their hosts. While continued humanitarian assistance is essential, steps must also be taken to provide Syria’s neighbours with economic support and developmental aid. More specifically, the international community must help to create new job and livelihoods opportunities throughout the region, thereby allowing the refugees to support themselves and live in harmony with local communities. So far, the world’s financial institutions, banks, development actors, donor states and private sector companies have not pursued these objectives with sufficient vigour. Finally, if the region’s generosity is to be maintained, then more prosperous parts of the world must set a far better example with respect to the way that they respond to the refugee issue. At a time when countries in the Middle East have given refuge to four million Syrians, it is very disappointing to see that countries such as the UK and USA have failed to share a small proportion of that burden by establishing refugee resettlement programmes. Australia has set an even worse example by subjecting refugees to long-term detention, by transferring its unwanted refugees to developing countries and by paying human smugglers to turn back their boats. This article was originally published on OpenDemocracy under a Creative Commons Attribution-NonCommercial 4.0 International licence.